Swargiya Shri Ram Lochav Education Society was founded in 1993 with a noble intentions to spread education over the country & since has been devoted to impart quality education to fellow Indians. Our Motto has been & shall remain to provide quality education. The Word ‘Sri Ram’ not only provide sense of culture, Honesty & Purity. But also bless our noble intention. 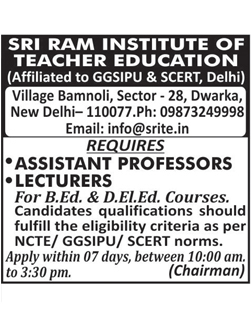 The vision of the Sri Ram Institute of Teacher Education is to provide quality teacher education to all Students enrolled in the institute. Pupil teachers are given a thorough knowledge and build foundation in both theoretical and practical aspects of teaching-learning. The Instutute offers quality education with the objective of promoting excellence in teacher education and the college will try accorded 5-Star accreditation for its distinction in producing quality teachers. SRITE is a top and renowned institution providing education courses such as Bachelor of Education (B.Ed), and Diploma in Elementary Education (D.El.Ed) in Delhi. We offer highest quality training with equal emphasis on theory and practical training . SRITE is very well-equipped. The library has thousands of titles. Our Professors and lecturers are well qualified and experienced. Come, visit our campus and experience the peaceful and beautiful atmosphere yourself! copyright © 2016 Sri Ram Institute of Teacher Education. All rights reserved. Website designed & maintained by iGreens Softech Pvt. Ltd.